I didn’t blog about November Winter Series as it all went a bit pear-shaped, plus with there being one show a month I thought it would be quite tedious to read about each one. So I’m going to combine them into pairs. The first Winter Series was before Wilmslow. I was aiming to train but not quite as much as I should have done. We set up on the start line of Steeplechase, first run of the day, Guinness broke his wait, missed a few jumps in a sequence, we fluffed about and eventually finished and walked out laughing it off. Then onto Jumping, we got onto the start line, into a wait, lead off, Guinness runs off. Back into his old habit he runs past the first jump, turns around and stands barking at me. Nothing will get him back to me. So I ran out past the last jump and out of the ring and he went back into the car. For the rest of the day we put ourselves down as NFC, went into the ring with a toy and did some waits and play in different places. I’d set my plan now, we are going to train every run (except for Steeplechase) working on start line waits, weaves and contacts. We started off in Jumping, set the timer running and ran into the middle of the ring on-lead. I did some wait practices on-lead and some off-lead. Onto the weaves and Guinness would only do 10 poles (ARGH!). I had to carry my lead around and it wouldn’t fit in my pocket so I found I was a little awkward. Second run I decided to stick to one thing and only worked on waits then did a little bit of handling. 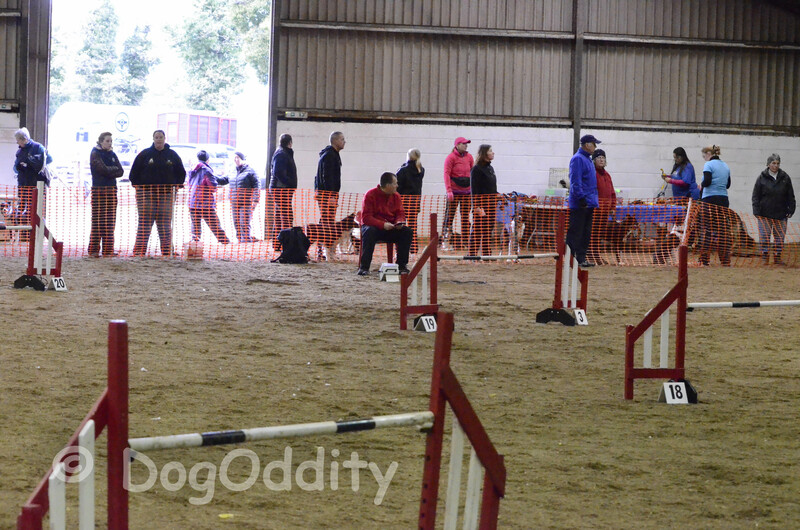 In Agility we started in the middle, did one wait practice and then went over some contacts and attempted the weaves. It was a tricky weave entrance from a tunnel and I stood my ground near to the tunnel and sent him to weave. He looked at me, looked at the weaves, ran ahead and nailed the entrance! WOOO! However he only did 10 poles again! I have decided that it must be because I throw a toy to reward the weaves, and to get the timing of the reward right I must throw it when he is in pole 9-10. So the plan to fix this is to train weaves driving to a closed treat tub with cheese in and reward by running and opening the tub. Also driving to a dead toy at the end of the weaves, but I’ll need someone there who can pick it up if he fails. Second agility run and I enjoyed handling the 270 front cross into a 180. I felt that my turns were really tight, especially after the training session I had with Bob Sharpe recently. Also Guinness was tugging on the start line of each run, while still on a lead, which is amazing! He has not done this before and its something that I really want, plus its one step closer to tugging in the queue. End of the day Steeplechase and I went for a competition run. We ran start to avoid ruining our wait training and there was 2 jumps, tunnel, then jump at an angle turning to next line of jumps. I was up for it and I set off sprinting after Guinness. He ran ahead very nicely and the angle of the jump allowed him to get it and also turn onto the next line so I had to quickly brake and change direction. There was loads of time for a rear cross and then a front cross around the tunnel and we pushed for a trickier rear cross finish rather than a slower pivot wing wrap. It half worked but was a little messy, but I’m glad with my choice. Low and behold we Won the class! 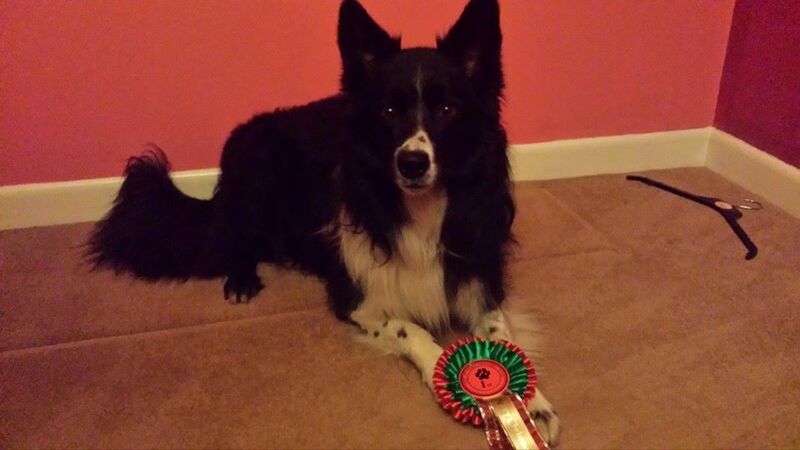 Against Intermediate dogs and 3 seconds faster than 2nd place! Looking at the results and Guinness was the 3rd fastest large dog overall, with the fastest Advanced dog beating us by 3 seconds (WOAH!) 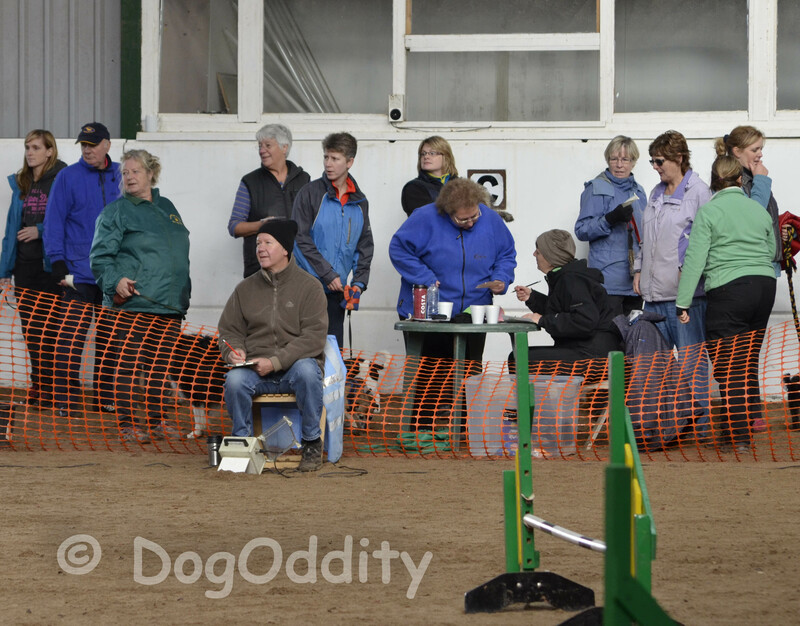 and then 2nd fastest also an Advanced dog only 0.6 seconds faster. Storming run, Guinness has some mega speed and no dropped poles. He has such potential for the future if only we can sort out our weaves and a start line wait would be good! I came away wondering if I was using my ring time wisely with the training I’d done. However having had time to sit and think about it I recon Guinness definitely needs more play and training within the ring and show atmosphere. Although he doesn’t freak out at a show and he mostly runs fine he definitely treats it different to a training session and I think he needs to learn that the ring is also for fun and play time. So we’re going to continue with tugging and playing in the ring while doing a lot of start line routines in different places, working from the inside of the ring slowly out towards the start positions.